Residents from Bansud, Pola and Socorro towns in Oriental Mindoro receive relief packages from employees of Smart and its provincial distributor. Smart employee-volunteers also distributed hot meals to evacuees in Sagnay, Camarines Sur. Smart set up “libreng tawag” (free calls) in areas where communication services were limited due to power outage and damage to infrastructure. These areas include the municipalities of Bansud, Pinamalayan and Socorro in Oriental Mindoro, and Bulan in Sorsogon, where residents were affected by flooding. 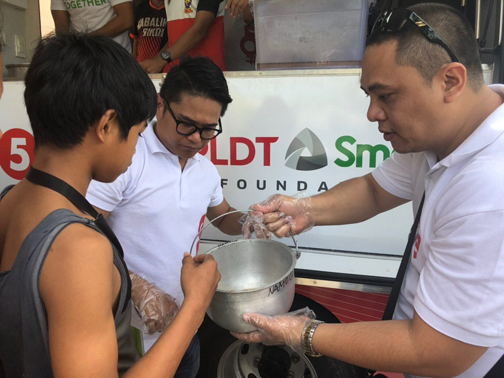 Smart joined teams from PLDT, PLDT-Smart Foundation, AlagangKapatid Foundation, One Meralco Foundation, Maynilad, Makati Medical Center Foundation, Philex Mining Corp., Asian Hospital and Medical Center, Latter Day Saints Charities and Kabalikat Albay and Camarines Sur chapters. It also helped organize a mobile kitchen in Sagnay and Buhi in Camarines Sur, Tiwi and Libon in Albay, all badly hit by Usman. The companies’ volunteers served hot meals to around 4,800 residents and distributed food packs to more than 4,500 beneficiaries. Smart also helped distribute relief goods to victims of flooding in Albay and Camarines Sur. In Oriental Mindoro, volunteers from Smart’s sales team and provincial distributor joined forces to hand out packages to residents in Bansud, Pola and Socorro towns. “We offer not only communications assistance, but also helped provide the basic needs of residents in the affected areas as they work on rebuilding their lives after calamities,” said Smart public affairs head Ramon R. Isberto. “These efforts are part of our commitment to help fulfill the needs and uplift the quality of life of every Filipino,” Isberto added. The communications and relief assistance offered by Smart to victims of calamities are part of the company’s #SafePH initiative. The program aims to help build resilience and mitigate risks by providing continuous communications services and essentials to individuals in times of need.